The following are WebSphere Portal v8 performance tuning and testing tasks. Find and remove bottlenecks that throttle throughput. System is running AIX v7.1 64-bit operating, using TDS LDAP and DB2 database. Tuning is all about iterations and repeatability. After implementing various tuning changes below, we will execute use cases to determine if new setting has improved or degraded performance. We will be using Rational Performance to generate load and reports. For authenticated access, generate sufficient unique test user IDs exist in the LDAP. The portal artifacts are generally cached on a per-user basis. If the load simulation uses the same user ID for all tests, performance appears artificially high because the artifacts do not need to be loaded from the LDAP directory and the database. Install Cache Monitor Middleware Pending We will get baseline measurements first, then enable caching and install monitor. Monitor JVM logs Middleware Pending No testing if fatal errors exist. Set cloneIds Middleware Optional Send traffic to a particular server for debugging. Extended Cache Monitor A WAS utility that provides statistics (number of entries used, cache hit ratio, etc.) on the DynaCache instances. IBM Support Assistant (ISA) Workbench Various Java-based tools to analyze thread dumps and verbose garbage collection (GC) output, specifically, "IBM Thread and Monitor Dump Analyzer for Java" and "IBM Monitoring and Diagnostic Tools for Java - Garbage Collection and Memory Visualizer". Cache Viewer Portlet A WebSphere Portal Server portlet (provided by IBM Support) that provides additional information about the internal caches used by Portal. Fiddler A free tool that breaks down the response timeline from the end-user's perspective. Page & Portlet Render Timers Displays server-side page and portlet render times for a given page, making it easy to identify the "long poles" in terms of the slowest portlets on the page. Portlet Load Monitoring Filter Limit the number of concurrent requests and the average response time allowed for JSR 168 or JSR 286 portlets. If a portlet exceeds either the defined maximum number of concurrent requests, or the average response time, then Portlet Load Monitoring no longer allows further requests by the portlet. Instead, the portal renders the portlet as unavailable, and the portlet code is no longer called for further requests. This way, the Portal installation is protected from non-responsive portlets consuming an increasing number of threads. Network Traces Use tcpdump or snoop to capture packets to and from the various servers. Wireshark Analyze the network trace output files obtained from tcpdump and snoop. J2EE Monitoring Tool Optional. ITCAM, CA's Introscope, and HP Diagnostics. Provides insight into where the time is spent from a JVM perspective. Allocate 4GB of RAM as large pages of 16MB each. After reboot, enable large page support. ...and verify alp column (active large pages) is a non-zero value. Consider setting the memory management option "lru_file_repage" to 0 to ensure that computational memory is prioritized over file I/O buffers. This setting ensures that in situations where physical memory becomes limited, AIX will not swap out the Java processes in favor of file I/O buffers. For Out of Memory errors that coincide with large object allocations when verbosegc.log shows plenty of available heap, fragmentation is the likely culprit. To fix, set -Xloratio0.1. If Percent Used counter is consistently low, decreasing the number of connections in the pool. If high, increase. Lower settings for the connection pool size (10-30 connections) typically perform better than higher settings (more than 100). When threads are waiting on JDBC pool resources in WAS, you see the threads in a condition wait (CW) state in the WAS connection pool (J2C) classes. In this case, we might need to increase the pool size for this data source. JVMSHRC010I Shared cache "webspherev80xxx" is destroyed. Could not create the Java virtual machine. MaxDirectMemorySize sets an upper bound on the amount of native memory allocated for DirectByteBuffers. This allows the system to avoid GC cleanup before growing the amount of physical memory allocated for these buffers. To start, IBM recommends setting. After increasing, monitor for paging and memory leaks. Find the following in native_sderr.log. The text in red shows that 32MB is needed, so the limit needs to be set higher than that value for optimal performance. This Generic JVM Argument prefetches bytes in the thread local heap ahead of the current allocation pointer during object allocation. It helps reduce the performance cost of subsequent allocations. Use it for AIX 64-bit JDK. 000000f3 AlarmThreadMo W UTLS0008W: The return of alarm thread "Non-deferrable Alarm : 2" (0000003b) to the alarm thread pool has been delayed for 32480 milliseconds. ...where xxxxx is greater than the number of milliseconds mentioned in the error message, for example 40,000. If value PercentMaxed counter is consistently in the double digits, the web container can be a bottleneck, and we need to increase the number of threads. If the number of active threads are significantly lower than the number of threads in the pool, consider lowering the thread pool size. To monitor, in TPV, under the Thread Pools module, watch the PercentMaxed counter. If the value of this counter is consistently in the double digits, the ORB might be a bottleneck, and we need to increase the number of threads in the pool. Watch the PrepStmtCacheDiscardCount counter of the JDBC Connection Pools module. Goal is to get lowest value possible. With the Portal 8.0 theme many resources do not change before and after logging in. These resources include the ra: collection URLs that are part of the theme. The same URL can safely be used for authenticated and unauthenticated users. Tune the VMM Context Pool to improve the performance of concurrent access to an LDAP server. ...and change the contextPool settings to..
Disabling tagging and rating can improve capacity by 3%. The Portal 8.0 theme multipart downloading can be disabled to improve performance. Disabling may cause performance issues on client side aggregation themes from earlier Portal releases. The portlet capability filter allows developers to get friendly error messages on pages if the theme profile in place for a page does not contain all the capabilities the portlets on the page require. In production this filter should be disabled. ...and delete all JCR collections. For rendering only sites where page management is not taking place locally, the Site Toolbar can be disabled. Run benchmarks to determine if the net effect is positive. The navigator service content model is periodically reloaded by WebSphere Portal. In a production environment where new pages for unauthenticated users are rarely created, setting this reload time to an hour or more will give better performance. This service also controls the HTTP cache-control headers which will be sent on unauthenticated pages. Increasing these cache lifetimes in a production environment can reduce load. public.expires 3600 Cache expiration time in seconds, for unauthenticated pages in browser caches and proxy caches. public.reload 3600 (seconds) Reload interval, in seconds, for internal cache of the list of pages visible to unauthenticated users. Portal uses the registry service to replicate information about resource types into memory. This replicated information is periodically reloaded. In a production environment, we expect this type of information changes very infrequently, so we set a very long reload time. default.interval 28800 Reload frequency for any object types not explicitly specified in the file. 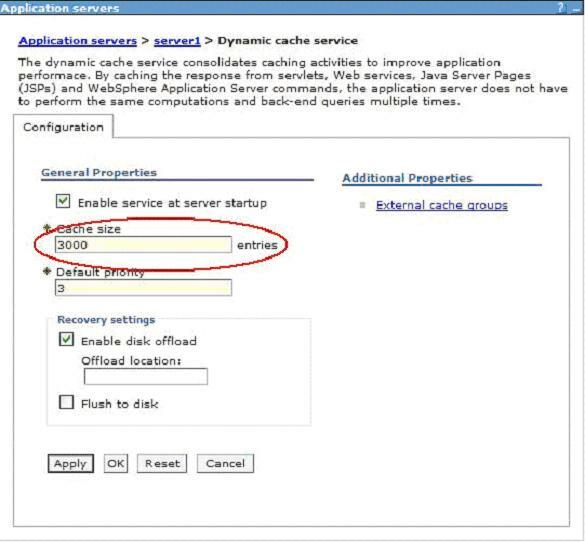 WebSphere Portal requires the WAS Dynamic Cache Service (dynacache) and cache replication be enabled. The default mode of replication, PUSH, can cause performance problems in the portal environment. WebSphere Portal V6.0.1.5 and V6.1 change the default for all Portal and WCM dynacaches to be NOT SHARED instead of PUSH. The use of NOT SHARED is strongly recommended for the vast majority of WebSphere Portal configurations. Three actions are needed to ensure that each Portal cluster member is fully optimized for WebSphere Portal V6.0.1.4 and earlier. The first is to set the replication mode to NOT SHARED using the WAS console for each cluster member. The second is to install Portal PK64925. The third is to install WMM PK62457 and add the parameter cachesSharingPolicy with a value of NOT_SHARED to the LDAP section of the wmm.xml files on each node. We can check out further details here. ...and change each of the individual cache instances to a mode of NOT SHARED. As of the time of this writing, there are 11 instances for WebSphere Content Manager. cacheinstance.com.ibm.wps.model.factory.UserSpecificModelCache.size 6000 This cache uses more memory per object than other caches. The value should be set based on the number of concurrent, logged in users. Larger values may require a larger JVM heap size. A value of 6,000 was used to support 6,000 virtual users in the benchmark measurements. Increasing to 7,000 in other measurements increased throughput but required a heap size of 4,608 MB. To cut down on Portal memory usage, for unused or lightly used caches which are over 5000 entries, IBM recommends cutting their size in half. To determine if caches are unused, monitor the caches when portal is running a representative workload mix under a high load. The caches that are unused under those circumstances can be safely reduced in size. When changing the size of a cache, using a prime number as the size may give slightly better results. This has been verified for first level caches. These include the JCR collection and the “Default Search Collection”. These search collections do not include the WCM Authoring search indexer. A large performance gain can be achieved by disabling the processing of personalization rules for pages and portlets. We are not using personalization rules, so we turn off the PZN preprocessor. Throughput can be improved by disabling nested group caches. Set the filesystem which will hold the Portal databases to be an Enhanced Journal File System (JFS2) because a large file system is limited to 64GB. Turn on concurrent I/O (CIO) for Enhanced Journal File System as this improves performance. Increase AIX maximum number of processes per user to 4096. The default 500 processes per user is too low for database server. The first command creates file runstats.db2, which contains all of the runstats commands for all of the tables. The second command uses the file to run these commands. Run on each Portal database. Run on the JCR and release database data population after significant content population or changes. Set database parameter MaxAppls to be greater than the maximum JDBC pools size for all portal data sources. Use System Managed Storage (SMS) for temporary table spaces. This saves time in buffer writes and improves disk utilization. Look in the reorg column for entries marked with a star or asterisk * in the file xyz.out. The file db2rbind.out is created when there is an error. DB2 9.7 supports automatic tuning of bufferpool sizes. IBM recommends enabling this setting on the JCR database. Other Portal database domains can use the default settings for DB2. This parameter controls how much optimization to use when compiling queries. The default value in DB 9.7 is 5. However, the Portal Info Center recommends setting this value to 2 for the JCR database. Performance benchmarks see the best results with this value as well. db2 "UPDATE DB CFG FOR USING DFT_QUERYOPT 2"
The DB2 registry variable MAX_JOINS_IN_UNION limits the number of joins the Query Rewrite component of DB2 is allowed to push down into a UNION operator. Some JCR queries result in a large number of unions with the default settings. Changing this setting limits the number of unions DB2 we use in a query, potentially reducing processing time. This setting should be changed when query preparation times are high on queries with multiple joins. In general, the more complex the SQL statement and the more complex the database, the more possible ways there are for Query Rewrite to rewrite the query and the more possible query plans there are for DB2 to evaluate. Setting MAX_JOINS_IN_UNION in this case limits the number of possible query plans that DB2 considers, and hence the amount of processing that is done to prepare the query while still generating a good query plan. Note that setting this value has no effect at query optimization level 1 (see previous section for query optimization). Performance benchmarks show the best performance with the default setting. No change was observed using a setting of 30. However, data population with deep content hierarchies may benefit from changing this parameter to a higher value. For large content population sizes, IBM recommends increasing the transaction log size as well manually size the sortheap. Using an automatic setting caused a problem where the DB2 STMM would decrease the size of the sortheap too drastically and cause poor performance on certain JCR queries. The following settings were appropriate for up to 1 million content items in their testing. IBM recommends monitoring sortheap during a peak workload and tuning appropriately. ServerLimit 3 This value should be set to MaxClients / ThreadsPerChild. MaxSpareThreads 3000 Should be set to the same values as MaxClients. KeepAliveTimeout 5 This value is less than the think time we define in our load measurement scripts to ensure that testing is conservative - forcing virtual users to open new TCP connections for each new page view. In a live environment, it can be helpful to increase the KeepAliveTimeout. However, a higher timeout value can increase contention for HTTP server processes, so if we are running out of HTTP processes, decrease this value. MaxKeepAliveRequests 0 Selecting 0 lets an unlimited number of requests calls to a single TCP connection. To increase MaxClients, either the ServerLimit or ThreadLimit or both must also be increased. Unix based HTTP servers cache information in each process. So, when increasing settings, raise the number of threads first before raising the number of processes. This reduces the overall memory needed by the HTTP server. The values used in the performance benchmarks are set to ensure there are sufficient resources to handle hundreds of hits per second from thousands of users. For smaller environments, lower values which use less server resources can be used. For example, to serve several hundred hits per second, ServerLimit could be set to 5, ThreadLimit could be set to 160 and MaxClients could be set to 800. To monitor the number of running, and available Web server processes, enable the server-status module. The web server must allow for sufficient concurrent requests to make full use of the application server infrastructure. The web server also acts as a filter and keeps users waiting in the network to avoid flooding the servers if more requests than the system can handle are incoming. MaxClients is currently set to 600. Given that CPU cycles are considered "expensive" on the Portal/WAS servers and cheaper on the IHS/Apache servers, it is very desirable to reverse proxy these statics on the IHS servers using the mod_cache facilities. Prior to IHS version 7, the only choice available was the "mod_mem_cache" module. Mod_mem_cache provides an RFC2616 compliant reverse proxy cache. IHS version 7 added support for the "mod_disk_cache" option in addition to the mem_cache. Choosing the best type of cache neither intuitive nor obvious. The Apache Caching guide provides some guidance. Cache is "Per process": Apache spawns processes to handle inbound HTTP(S) requests. An instance of the mem_cache is created for each process. There is duplication of cache entries in this scenario (i.e. wasted CPU memory). Cache size limitations: Because of "1", the cache instances must necessary be limited in size to not exhaust CPU main memory. There are several mod_mem_cache directives to help in limiting the size of responses that can be stored in the cache. Occasional inefficient replacement algorithm: Because of "1" and "2" together, responses that are near the limit of the size allowed in the cache, make force removal of responses better left in the cache. Limited capability for stale pages: Because the cache is limited in size and because it gets regenerated with each new process instantiation, there is very limited chance of stale responses being in the cache. Cached responses are shared among all process: There is on instance of the cache system wide. Therefore, there is less wasted space in memory. Need to use clean up utility - htcacheclean: mod_disk_cache does not automatically clean stale items in the cache. This can result in wasted disk space. More troubling is that some responses from the response owner (i.e. Portal/WAS) may not have proper cache-control headers indicating how long responses are allowed to live in proxy caches. Therefore, the cache can potentially return the wrong, stale version of a response. The htcleancache utility is therefore needed to be periodically used (via "cron", for example), to insure stale responses are removed from the cache. Need to allocate disk space: Since the responses are stored on disk, there is always the potential to exhaust disk space. When first considering which type caching to use, most would immediately suggest mem_cache as the better option. From a performance perspective, serving from memory is obviously better than serving from a disk. In reality though, because of how Unix/Linux buffer file I/O works, the benefits of disk_cache become apparent. Unix allocates unused portions of memory to buffer files as they are read. So, the initial read request starts reading the file into memory. Subsequent read requests for the same file are read from memory without even touching the disk. So, with the exception of the initial load, disk_cache performs as well as mem_cache and there is only one instance of the response in memory as opposed to "per process" duplication of mem_cache. Because memory utilization is more efficient, cache hit ratios can be much higher with disk_cache. The HTTP protocol allows the server to tell clients how long they can cache responses. When the client has the content in their cache, they do not need to request it again, saving the round-trip time to the server to retrieve the content. Add the following to the httpd.conf file. ExpiresByType application/xml "access plus 1 week"
ExpiresByType application/vnd.mozilla.xul+xml "access plus 1 week"
ExpiresByType application/x-www-form-urlencoded "access plus 1 week"
ExpiresByType application/atom+xml "access plus 1 week"
# note the following max-age=86400 is just an example. # header added. Your site might need to be more selective. # Make sure the LoadModule directives above have been issued. # That is not shown here because the intent is they should be loaded. IBM HTTP Server supports compression using the mod_deflate module. When enabled, the HTTP server checks the Accept-Encoding header sent by the browser to see if it can accept a compressed version of the content. If so, the HTTP server will compress the content before sending it to the browser. IBM has observed an average of 65% network traffic reduction when deflate compression is enabled. However, the compression operation does not come for free as they also observed approximately a 10% processor utilization increase on the HTTP server. In benchmarks, the best performance was seen when Portal gzipped the content once at startup and the HTTP server cached the compressed version of the content. However, this environment does not have a significant amount of other static content. In sites with a large number of static files, performance may be improved by compressing that content as well. This can be done dynamically by the HTTP server. # these next 3 are for outputting to a log and go along with a LogFormat not mentioned here. To make the changes permanent, also select “Save Current Parameters for Next Boot”. These tuning settings - particularly the tcp_sendspace and tcp_recvspace values - will allocate a significant amount of memory for network buffers. These can cause a performance problem if the system has a limited amount of memory. In that case, it may make sense to reduce these values. By using the loadRolesParentBased algorithm in the authoring environment, IBM showed an approximate 70% improvement in capacity was seen in performance benchmarks. The loadRolesParentBased setting changes the loading algorithm for the ROLE_INST and LNK_USER_ROLE tables in the database. Instead of loading all assigned roles for a specific principal, only the currently requested access control data is loaded and cached. This is beneficial to a dynamic type of workload like authoring where there are many items being created and deleted that require cache updates. Be aware that this setting may increase database load since fewer items will be cached so be sure that your database server has spare capacity before setting. accessControlDataManagement.loadRolesParentBased true Use the loadRolesParentBased setting in WCM authoring environments only. This is especially helpful when the Web Content Viewer portlet is displaying non-personalized content. Login to portal as an administrator and navigate to page containing the rendering portlet to enable portlet caching or select "Edit Layout" for the page in the "Manage Pages" Administration portlet. Select "Configure" or "Edit Shared Settings" from the dropdown in the upper part of the portlet. When set under Configure mode, the settings apply to all instances of this portlet. In Edit mode the settings only apply to that one instance. Log in as a Portal Administrator and navigate to the “Manage Pages” portlet. ...and select "Edit Shared Settings" from the dropdown in the upper part of the portlet. Under Portlet Settings | Portlet Cache Options | Cache Scope: Select "Shared cache across users"
Give an administrator account access to the application. Applications | Application Types | WebSphere enterprise applications | Dynamic Cache Monitor | Security role to user/group mapping | administrator | Map Users | user account | "selected"
Login to the Cache Monitor application. At this point any WCM Web Content Viewer JSR 286 portlet with caching enabled should add entries to this cache. To look at the contents of the cache, click on the Cache Content link on the left side menu. In addition to viewing the contents of the cache, we can also use the Cache Monitor application to view cache statistics, invalidate individual cache entries, and compare cache content. We analyze JVM garbage collection patterns using an IBM Support Assistant tool such as PMAT. We leave verboseGC enabled, even during production. The amount of log data is not large; however, it is invaluable in terms of the visibility that this log brings to heap utilization problems. Verify the site is able to handle the required number of concurrent users. The testing done to test for throughput doubles for testing the concurrency. Similar to peak throughput expected, the business will have peak concurrency expected. There would also be business requirements of the site to maintain performance past peak concurrency expected, which we call the required business concurrency. Corresponding to the throughput breaking point, there would be a concurrency breaking point. The preferred approach for stress testing a system is to stick to the realistic think time and gradually vary the number of virtual users so the throughput exceeds the expected peak throughput (TP), then reaches the throughput level corresponding to the maximum business capacity (TP), and, eventually, reaches the breaking point (Tx) after sustaining the maximum system capacity (TC). This approach will give you realistic test results that are easy to interpret. The increase in throughput will be accompanied by an increase in CPU consumption, eventually maximizing the CPU when maximum throughput is achieved (TM). However, in case we are testing on a test environment that is not as powerful as your production environment and you find we are limited by your test hardware such we are not able to increase the number of virtual users to take the system to the breaking point (Tx), then an alternative would be to decrease the thinktime. Decreasing the think time in your test scenarios way past the expected think time is akin to increasing virtual users way past the expected value. We can even turn your think time down to zero to maximize the stress on the site for a given number of virtual users. This approach also benefits if we need to maximize your CPU consumption and throughput very quickly, instead of having a long trial and error process. However, the trade-off for this approach is the lack of ready-to-use test results. You would need to scale the results that you get from this test methodology so that we can interpret the corresponding behavior on your production environment for more realistic scenarios. Such a scaling activity would require running a few experimental test cases and interpreting the results to come up with a scaling factor. Most of the time, especially for small and medium sized customers, such a scaling may turn out to be a linear factor. Any such scaling would need to be repeated with any major change in your system hardware, software, application, data, or even scenarios. Once the system has reached maximum throughput (TC), the response times of further client interactions may not be relied upon. In our testing we find that WebSphere Application Server scales to increase in workload extremely well. So, although WebSphere Application Server handles all the additional work given to an application under stress, the queuing-up of workload leads to longer response times. For example, as the number of virtual users keep increasing and there are no more CPU cycles to accommodate this additional workload, then each virtual user gets a smaller and smaller time share of the CPU, driving the response times higher. These response times may be unacceptable for shoppers or users of the site. So, although the above approach provides you with an easy mechanism to stress the system and to look for bottlenecks, it still leaves the question of observed response times unanswered. Reliability testing is done around expected peak capacity (P) and higher. Usually, the testing should be conducted close to required minimum business capacity (B) but not more than the maximum system capacity (C). The key factors of reliability testing is the duration for which the test is run as well as the variable workload to mimic typical day-to-day activities on the site. Reliability runs are usually run for days and can be half a day, one day, and so on, generally going up to seven days. A three-day reliability run is very common, since this is usually long enough to start showing symptoms of many performance problems, should they exist. A three-day test also gives you an opportunity to start it on a Friday, observe the test for a little while, then leave it running for the weekend, and then come back on Monday and observe the test in execution for another little while before it completes. For peak workload expected and minimum business capacity required, the error rate must be less than the acceptable error margin, as defined by your business requirement. For example, the acceptable error margin may include page errors less than 0.1%, resulting in less than 1% failed scenarios. Concurrency, throughput targets should be met or exceeded for both peak workload expected as well as for minimum peak business capacity required. Response time targets should be met or beat for both peak workload expected as well as for minimum peak business capacity required. For excess capacity past minimum business capacity although response time is allowed to go past the maximum requirement, the acceptable error rate should still conform to your business requirements. If any of these passing criterion are not met then it should be considered a defect. If error rate is the cause of the test case failure then the defective code needs investigation. Use the nmon data collection model to collect detailed status data about the operating system for further analysis. This example collects nmon performance results 180 times with an interval of 60 seconds, writing results to file: hostname. The -t parameter is used to focus our attention on the status of the top processes. A result file named hostname_timeSeries.nmon will be generated in the current directory. After collecting data, download output file and load into your nmon-enabled Xcel spreadsheet. Use vmstat to monitor memory and paging. If "pi" or "po" columns are above zero, paging is occuring. Think time is a delay in the processing of an HTTP request to reproduce the time that a human would take to read or examine the data displayed from a previous user action. Think time is calculated from the time that a request is received (that is, the display is complete on the monitor) until the time the user clicks a key or link to perform an action. We can increase, decrease, or randomize think time in tests or play it back exactly as recorded. Number of active virtual users at which point adding more virtual users does not result in an increase in the number of page views (PVs) . To effectively drive a system to saturation, add Vusers a few at a time, let the system stabilize, observe whether PVs increase, and add more Vusers as possible. ("Stabilize," in this context, means the response times are steady within a window of several minutes.) On LoadRunner, if you plot Vusers against throughput (PVs), the PVs initially rises linearly with the number of Vusers, then reaches a maximum and actually decreases slightly from that point. The saturation point is the number of Vusers at which the PVs is at maximum. At saturation, to determine the cause, take a Java thread dump (kill -3) against the portal Java process under test. Look for threads that are blocked or in a wait state. Unchecked exceptions slow down JVM down and causes serial I/O to the SystemOut.log print stream, serializing the WAS transport threads. Results on systems with flaws are considered non-repeatable. 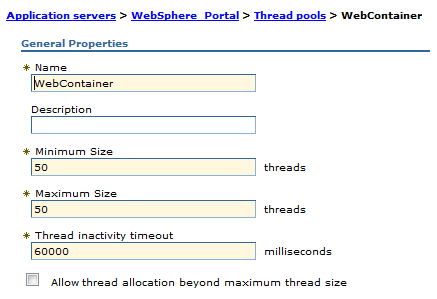 WebSphere Portal should not be allowed to enter a high-load production environment with any errors in the logs. The t parameter is used to focus our attention on the status of the top processes. The iostat command is used for monitoring system input/output device loading by observing the time the physical disks are active in relation to their average transfer rates. The iostat command generates reports used to change the system configuration to better balance the input/output load between physical disks and adapters. All statistics are reported each time the iostat command is run. The report consists of a tty and CPU header row followed by a row of tty or asynchronous I/O and CPU statistics. On multiprocessor systems, CPU statistics are calculated system-wide as averages among all processors. The iostat command generates four types of reports: the tty and CPU Utilization report, the Disk Utilization report, the System throughput report, and the Adapter throughput report. Basically, we can set the interval and count for this command.The interval parameter specifies the amount of time in seconds between each report. If the interval parameter is not specified, the iostat command generates a single report containing statistics for the time since system startup (boot). The count parameter can be specified in conjunction with the interval parameter. This command is used to capture and analyze a snapshot of virtual memory. The svmon command displays information about the current state of memory. The displayed information does not constitute a true snapshot of memory, because the svmon command runs at the user level with interrupts enabled. The segment is has a set of pages and is the basic object used to report the memory consumption, so the statistics reported by svmon are expressed in terms of pages. A page is a block of virtual memory, while a frame is a block of real memory. Frames always have a size of 4 KB, whereas pages may have different sizes. The base page size is 4 KB. All pages inside a segment have the same size. free counter Free frames from all memory pools. pin counter Pinned frames (that is, frames that cannot be swapped). virtual counter Pages allocated in the system virtual space. paging space counter Pages reserved or used on paging spaces. Time that must elapse before TCP/IP can release a closed connection and reuse its resources (TIME_WAIT state). During this time, reopening the connection to the client and server costs less than establishing a new connection. Use "no -a" to determine current value. The value (1) is in 15 second increments. For example, 1 equates to 15 seconds, 2 equates to 30 seconds, and so on. IBM recommends that set the value to 1 or 2. If several threads are in the Socket.read() method of the JNDI classes, they are likely waiting on results from the LDAP directory. Use this task to interpret cache monitor statistics to improve the performance of the dynamic cache service. Verify that dynamic cache is enabled and the cache monitor application is installed on the appserver. Use the cache monitor to watch cache hits versus misses. By comparing these two values, we can determine how much dynamic cache is helping the application, and if we can take any additional steps to further improve performance and decrease the cost of processing for the appserver. Start cache monitor and click on Cache Statistics. Cache Size Maximum number of entries the cache can hold. Used Entries Number of cache entries used. Cache Hits Number of request responses served from the cache. Cache Misses Number of request responses that are cacheable but cannot be served from the cache. LRU Evictions Number of cache entries removed to make room for new cache entries. Explicit Removals Number of cache entries removed or invalidated from the cache based on cache policies or were deleted from the cache through the cache monitor. Default priority Default priority for all cache entries. Lower priority entries are moved from the cache before higher priority entries when the cache is full. We can specify the priority for individual cache entries in the cache policy. Servlet Caching Enabled If servlet caching is enabled, results from servlets and JSPs files are cached. Disk Offload Enabled Specifies if entries that are being removed from the cache are saved to disk. Wait for the appserver to add data to the cache. You want the number of used cache entries in the cache monitor to be as high as it can go. When the number of used entries is at its highest, the cache can serve responses to as many requests as possible. When the cache has a high number of used entries, reset the statistics. Watch the number of cache hits versus cache misses. If the number of hits is far greater than the number of misses, the cache configuration is optimal. You do not need to take any further actions. If we find a higher number of misses with a lower number of hits, the appserver is working hard to generate responses instead of serving the request using a cached value. The appserver might be making database queries, or running logic to respond to the requests. If we have a large number of cache misses, increase the number of cache hits by improving the probability that a request can be served from the cache. To improve the number of cache hits, we can increase the cache size or configure additional cache policies. 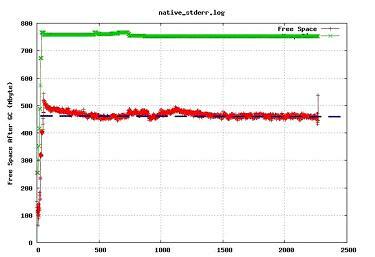 If the free space after GC declines with no growing AF, then most likely cache tuning is causing the memory problems. Caching does not necessarily mean DynaCache. It includes other types of cache that are being used. One solution is reducing the in-memory cache size and letting the overflow entries use the disk cache if possible. IBM recommends having 40% of JVM free after caching is enabled. Sometimes an excessive number of cache objects look like a memory leak since the cache grows as the application receives an increasing load. Customers and testers need to find a stabilization point where the system does not generate OutOfMemory errors due to too many cached objects. 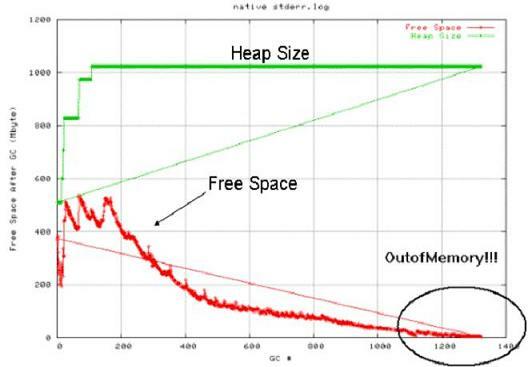 Tune the cache size according to how much heap size is being used. In Figure 24-13, the example shows an OutOfMemory exception. After further examination, you see the cached page is 60-100 KB in size and the number of cache entries is set to 5000. Therefore, half of this 1 GB heap is allocated to the cache. Note: A quick way to rule out caching, such a Dynamic Caching, concerns that may work for you is to try turning-off Dynamic Caching altogether, to force disk caching, or to keep all cached objects in memory. The behavior of your application under such circumstances may reveal whether caching policies or disk offload may be contributing to your caching concerns. Note, however, that this trial-and-error approach may change your application's error path and thus deviate from the error-causing scenarios. In most cases, we can adjust the DynaCache size to eliminate such problems. Log in to the WAS administrative console. Set the value of the cache size that we want. IBM Web Server Plug-in Analyzer for WebSphere Application Server helps discover potential problems with trace and configuration files during use of WebSphere Application Server. The tool parses both plug-in configuration and corresponding trace files and then applies pattern recognition algorithms in order to alert users of possible inconsistencies. The package includes the stand-alone code, documentation, and license files. Provide warnings or clues to information when configurations appear to be set inappropriately. Collects WebSphere Application Server cluster and member topology information within the configuration file. Displays a visual mapping of the cluster and member topology. Parses the plug-in trace files and creating models based on HTTP request/response header/body information, HTTP return code, URI, start/end time, cluster name, and server name. Displays the requested trace information based on query. The trace information has HTTP return code analysis and HTTP request/response header/body analysis. All requests to the appservers flow through the HTTP Server plug-in. The application server selection logic in the plug-in has been enhanced so that it takes into account the number of pending connections to the application server. The maximum number of connections attribute is used to specify the maximum number of pending connections to an application server that can be flowing through a Web server process at any point in time. Each application server can have a maximum number of pending connections coming from Web server plug-ins. The default setting is No Limit, which is the same as though the value is set to -1 or zero. The attribute can be set to any arbitrary value. For example, let the two appservers be fronted by two nodes running IBM HTTP Server. If the MaxConnections attribute is set to 10, then each application server could potentially get up to 20 pending connections. If the number of pending connections reaches the maximum limit of the application server, then it is not selected to handle the current request. If no other application server is available to serve the request, HTTP response code 503 (service unavailable) is returned to the user. To monitor the behavior of the plug-in when a cluster member has too many requests, use a load testing tool (such as ApacheBench or JMeter), the plug-in log, the HTTP servers' access log, and Tivoli Performance Viewer. For our test we have configured wasmember05 to have a maximum connection setting of 3 and wasmember06 of 4. We have one HTTP server fronting the appservers. Running a load test with 30 concurrent users against this cluster eventually results in both members having reached the maximum connections value. At this point, the user gets Error 503. Further down in the plug-in log we can see that eventually both servers respond to requests again when they have reduced their backlog. [Wed May 11 07:26:23 2005] 00007ab9 b640bbb0 - P1ATS: ws_server: serverSetFailoverStatus: Server wasna01_wasmember05 : pendingConnections 0 failedConnections 0 affinityConnections 0 totalConnections 1. [Wed May 11 07:26:23 2005] 00007ab9 aa5f8bb0 - P1ATS: ws_server: serverSetFailoverStatus: Server wasna01_wasmember05 : pendingConnections 0 failedConnections 0 affinityConnections 0 totalConnections 2. [Wed May 11 07:26:23 2005] 00007ab5 b4608bb0 - P1ATS: ws_server: serverSetFailoverStatus: Server wasna02_wasmember06 : pendingConnections 3 failedConnections 0 affinityConnections 0 totalConnections 4. [Wed May 11 07:26:23 2005] 00007ab9 b5009bb0 - P1ATS: ws_server: serverSetFailoverStatus: Server wasna02_wasmember06 : pendingConnections 2 failedConnections 0 affinityConnections 0 totalConnections 4. [Wed May 11 07:26:23 2005] 00007ab9 b3c07bb0 - P1ATS: ws_server: serverSetFailoverStatus: Server wasna02_wasmember06 : pendingConnections 1 failedConnections 0 affinityConnections 0 totalConnections 4. [Wed May 11 07:26:23 2005] 00007ab9 b5a0abb0 - P1ATS: ws_server: serverSetFailoverStatus: Server wasna02_wasmember06 : pendingConnections 0 failedConnections 0 affinityConnections 0 totalConnections 4. This feature helps you to better load balance the appservers fronted by the plug-in. If appservers are overloaded, the plug-in skips these appservers automatically and tries the next available application server. However, a better solution is to have an environment that can handle the load we are expecting and to have it configured correctly. This includes setting weights that correspond to the system capabilities, having the correct balance of cluster members and Web servers, and setting up the queues for requests and connections. In a normal Free Space after GC graph, where the application is using the Java heap properly, the red line should be approximately on a horizontal line. With a memory you get a declining red line. The free space available to allocate is decreasing. 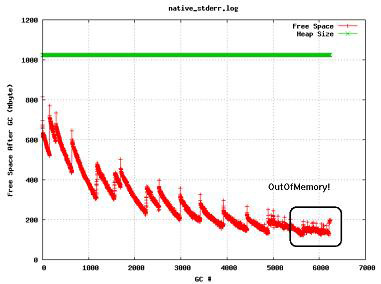 If we suspect a memory problem, continue running the test until an OutOfMemory exception occurs because some downward trends in free space will stabilize after a period of time. This helps you to get better support from WebSphere Application Server and the JDK if the problem is related to or the JDK. If the thread dumps (kill -3) indicate threads waiting in JDBC classes in Socket.read() methods, then there are likely response time issues in the database itself. At initial database transfer time, Portal sets up the databases with indexes that should be good initial starting points. The DBA should monitor the database and effect changes to remove bottlenecks in the system. When thread dumps indicate excessive JDBC wait times, take snapshots for long queries. Generally, Portal and WCM queries all execute in subseconds, if not in milliseconds. Look at the execution plans for long-running queries, and see if additional indexes might be required to improve response times on problematic queries. When threads are waiting on JDBC pool resources in WAS, you see the threads in a condition wait (CW) state in the WAS connection pool (J2C) classes. In this case, we might need to increase the pool size for this data source. Note that in doing so, we might need to increase the number of connections the database server can handle concurrently. The IBM HTTP Server server-status page is available on all supported IHS platforms. It shows performance data on a Web page in HTML format. Save the changes and restart IHS. ...and click Refresh to update the status. ..to refresh every 5 seconds. We can see the number of requests currently being processed and the number of idle servers. The Workload Manager (WLM) in WebSphere does load balancing and can direct traffic to any available clone in a cluster or cell defined for the application. We can hit a clone directly through the WebSphere port defined for the WAS, but in most environments that is blocked by a firewall. To go around this block, use IHS rules that direct traffic to a clone based on URL query strings. The first thing to do is to identify the names for your clones. Use the name specified in the WAS administrative console. We also need to know the port from which the clone is served. After you have this information, edit httpd.conf files with a new stanza. For this example, the keyword is cloneID, and the CloneNames are WebSphere_Portal and WebSphere_Portal_Clone_2 with ports 9085/9086. 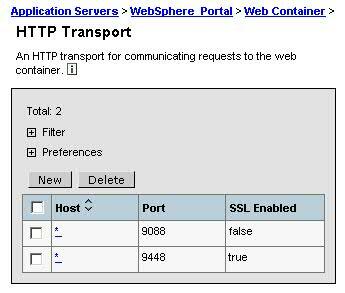 The target WebSphere Application Server hostname is host name.ibm.com. This stanza, after it is added to all your IHS servers, allows us to obtain session affinity with a specific clone. To use this stanza, for example, you access the portal application and append ?cloneID=WebSphere_Portal_Clone_2 to the URL, and your request is sent to WebSphere_Portal_Clone_2. This method is useful in large-scale evironments where you have many clones and we need to debug or reproduce a problem, and you don't want to search through every clone on each server to find where your request went. It is also a great tool for finding issues that are clone-specific or when to measure performance times of components based on log timestamps.